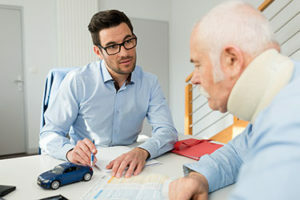 A personal injury lawyer can be a big help when you are trying to get compensation from someone who injured you, or when trying to negotiate with their insurer. However, not everybody needs to hire a lawyer to obtain compensation. It all depends on certain circumstances. You can also receive compensation for less tangible injuries like pain and suffering, emotional distress, or physical disfigurement. These intangible injuries can be worth as much—or even more—than economic losses like lost wages, medical bills, and property damage. Sit down and estimate how much your injuries are worth. Look at medical bills, pay stubs, and repair estimates to calculate economic losses. Then multiply these by 2 to 3 to calculate any intangible injuries like pain and suffering. If your injuries are worth a thousand dollars or less, you might be able to get by without a lawyer. Hiring one may not be worth the money, and you might struggle to find someone to represent you. However, if they are worth more, then you should consider at least consulting with an attorney. Many injured victims settle their claims before ever going to trial. However, negotiating with a powerful insurance company can be tough, especially if you don’t like conflict. Think back to other situations in which you negotiated, for example at a dealership when buying a new car. Did you enjoy the experience? Were you able to get a good deal by dickering with the sales agent? If not, then you may have trouble dealing with a skilled insurance adjuster, and you may need a lawyer to represent you. Can You Learn Court Rules? The only real leverage you have in settlement negotiations is that you can file a lawsuit if negotiations fail. You might even file a lawsuit before engaging in settlement negotiations. Regardless, learning court rules on your own is time-consuming. Fortunately, the Colorado small claims court system is available to you. This court has simplified procedures and you don’t need a lawyer. Unfortunately, you can only file in small claims court if you are seeking $7,500 or less. If your case is worth more, you’ll need to file in county or district court and follow the same rules as a lawyer. If you don’t think you have the time to learn these rules, you should probably talk to a personal injury lawyer about representing you. We understand how stressed accident victims feel. At the Olson Law Firm, our team has helped countless accident victims get the compensation they deserve to begin repairing their lives. To help you decide whether you want to hire us, we offer potential clients a free consultation, which you can schedule by calling 303-586-7297 or submitting our contact form online.